One thing I love about plants is the way they tie the world together, stitching continents and time in an ever-changing tapestry of free association. Eric puts up a post on Cyathea cooperi, a tropical tree fern so unfriendly its keepers need hazmat suits to move it, and next thing you know, in comes a question from Louisa about fiddleheads, the delicious baby fronds of the circumboreal ostrich fern, Matteuccia struthiopteris. This foragers’ favorite doesn’t appear until mid-spring, roughly in synch with the morels, but it’s never too early to get ready for collecting. Happy to say I do know. This pleasure of spring renewal has been finding its way to my own plate for several decades now, and questions about it were perennials when I was answering garden questions for the New York Times. Drawing by Bobbi Angell, award winning illustrator for the New York Botanical Garden (among many others) and my long-time friendly collaborator at the Times. Nutritionally, fiddleheads are your basic dark green veg – reasonably high in vitamins A and C, rich with assorted minerals and low in calories. The “bad thing” part is that they contain compounds (not yet identified) that can cause severe gastric distress if not neutralized by thorough cooking. Nobody seems to have noticed this in the old days, when the accepted way to cook wild greens was to boil them a while, throw out the water, then boil them some more. But when they started being lightly stir-fried and even – bad idea! – served raw, reports of unhappy reactions began to show up with some regularity. 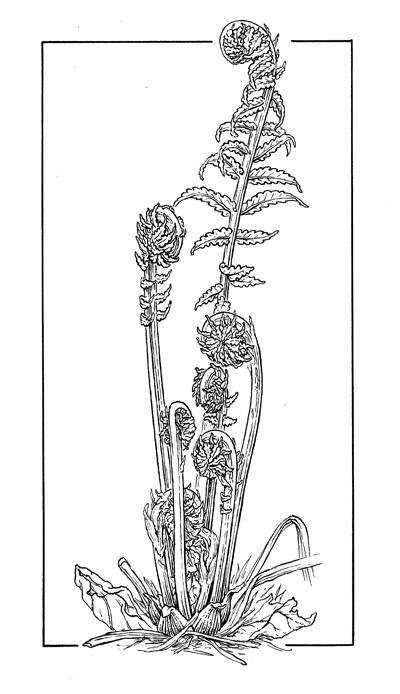 It isn’t enough to look for “fiddleheads,” young fronds that are tightly coiled like the top of a violin or a bishop’s crosier. The boggy terrain favored by ostrich ferns supports a whole orchestra of species that start out this way. Be sure to pick only the ones that have smooth stems with a groove down the inside and papery brown scales that are easy to rub off. Also be sure you don’t pick more than a third of any one clump. And use common sense – to the extent you can – about safe habitat. Ferns growing near industrial sites and dumps laced with heavy metals are better admired in the vase than on the end of a fork. 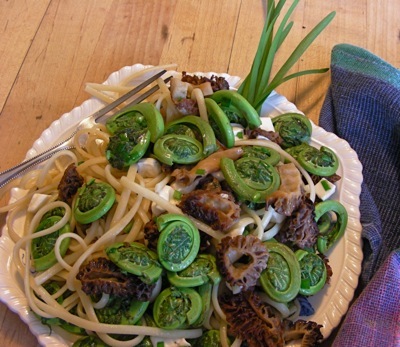 The University of Maine offers a nice fiddlehead fact sheet that includes recipes. Extensive botanical lowdown, with habitat description and links to even greater detail, is at the Hardy Fern Library; and you can check out the economic botany angle here. 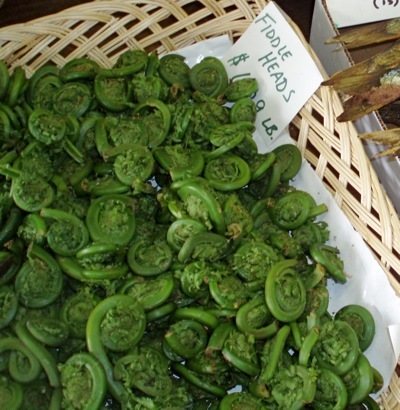 In season, in Maine and maritime Canada (and high-end greengrocers all over the US), there are fiddleheads for sale, usually at lower prices than those commanded by most wild foods. Select as you would select asparagus: coils should be tight and firm, there should be little or no damage where scales have rubbed off and cut ends should be fresh-looking, not browned, dried out and/or split. Fiddleheads should be refrigerated as soon as possible after picking and kept cold thereafter, but small-town stores and roadside vendors usually just display them in open baskets wherever there’s room for the baskets to be. This is seldom a problem – local sellers are very close to the fiddleheads’ haunts and they’re moving the product so quickly it doesn’t have time to get sad. Bill took this picture a couple of years ago at Fales Store (founded in 1829), our town’s wonderful one and only, without which we would all perish promptly. The golden blades at right are the tails of alewives custom smoked for the store by 6th generation proprietor John Fales. The other known vegetable they resemble is long beans, in that “lightly cooked” does them no favors gastronomically, so you’re really not missing anything by being sure they’re ok. Fantastic. Thank you for all of the good information. The pictures have me salivating. I guess I’ll be steering clear of the ferns by our foundation since who knows what’s leaching out into the soil. Maybe the ones I transplated near our stream will produce for us this spring. Can’t wait! Thanks again for such an enjoyable and wonderfully informative response. 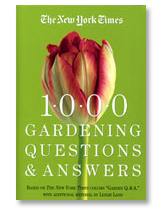 “One thing I love about plants is the way they tie the world together, stitching continents and time in an ever-changing tapestry of free association.” WHAT a wonderful sentence & concept!